The Amtrak Cascades is a higher-speed passenger train operated by Amtrak in partnership with U.S. states of Washington and Oregon. From Vancouver heading East. Dining each night with new and interesting people. High-speed rail (HSR) is a type of rail transport that operates significantly faster than traditional rail traffic, using an integrated system of specialized rolling stock and dedicated tracks. While there is no single standard that applies worldwide, new lines in excess of 250 kilometres per hour (160 mph) and existing lines in excess of 200 kilometres per hour (120 mph) are widely considered to be high-speed. High-speed trains normally operate on standard gauge tracks of continuously welded rail on grade-separated right-of-way that incorporates a large turning radius in its design. Many countries have developed high-speed rail to connect major cities, including Austria, Belgium, China, Finland, France, Germany, Ireland, Italy, Japan, Morocco, the Netherlands, Poland, Portugal, Russia, Saudi Arabia, South Korea, Spain, Sweden, Turkey, the United Kingdom, and Uzbekistan. China had 29,000 kilometres (18,000 mi) of HSR as of December 2018, accounting for two-thirds of the world's total. Speed had always been an important factor for railroads and they constantly tried to achieve higher speeds and decrease journey times. In general, travel by high-speed rail has been demonstrated to be remarkably safe. Up to six million people travel on China’s expanding high-speed rail network on any given day...The sprawling legions of 5G cellular base stations and towers that China Mobile spent years constructing along trunk rail routes can now be readily tapped to transmit huge chunks of data.This will enable for the first time simultaneous ultra-high definition video streaming and conferencing between a driving cab and a control center for better monitoring and trouble-shooting, even when a bullet train is galloping along at 350 kilometers per hour. That is on the strength of the proof-of-concept beam-forming technology as well as millimeter wave spectrum as key enablers to offer reliable service to drivers and passengers alike, including as the backhaul for train marshaling and on-board Wi-Fi. Ever since ASCE (the American Society of Civil Engineers) began issuing its “National Infrastructure Report Card” in 1998, the nation has gotten a dismal grade of D or D+. In the meantime, the estimated cost of fixing its infrastructure has gone up from $1.3 trillion to $4.6 trillion. In Europe and Asia, there are numerous high-speed rail (HSR) lines. For 2015, the U.S. High Speed Rail Association reported that there were 29,792km (18,512 miles) of high-speed lines, 3,603 train sets in operation and 1.6 billion passengers traveling on those lines annually. China alone laid about 19,000km (roughly 12,000 miles) of HSR in just nine years. Compared to other industrialized countries, the U.S. is woefully behind. [Presently,] the billionaire Koch brothers and their network of think tanks and dark money groups have been funding efforts to stop HSR and other public transit projects from taking place. It is a fight to the death between Big Oil and everybody else. Everybody else will benefit from HSR. It cleans up the air. It opens up all kind of new possibilities where you can live a more affordable life and get jobs further away... Everyone is going to benefit, except the oil industry, and that’s where the problem is.... There are some major changes needed to our transportation sector, which means that we need to electrify it. That will mean a whole lot of work for engineers... This is a huge project that the engineering profession needs to step up and be the leaders on. 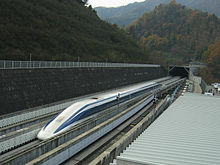 In 2008, voters approved a $10 billion bond to begin construction of a bullet train from Los Angeles to San Francisco that would make that trip in less than three hours. So who knew that by 2011 the general consensus would be that the project is an ill-conceived, mismanaged boondoggle? Former Amtrak spokesman and Reason Foundation writer Joseph Vranich knew. In 2008, before the state Senate Transportation and Housing Committee, he called the project "science fiction." He said the train won't travel from Los Angeles to San Francisco in less than three hours because that exceeds the speed of all existing high-speed rail. But on French railway schedules, a TGV (Train À Grande Vitesse) takes two hours, 38 minutes to go from Paris to Avignon... 430 miles... L.A.-to-San Francisco...is 432. So what's going on here? It's simple. Vranich makes stuff up ... The Reason Foundation says the Europeans are abandoning rail in favor of driving and flying. Nonsense. Transportation market share of European high-speed rail lines has grown steadily and many are near 80 percent. The Reason Foundation is funded by Chevron, ExxonMobil, Shell Oil, the American Petroleum Institute, Delta Airlines, the National Air Transportation Association and, of course, the Koch Family Foundation. They know what will happen once Americans, furious about gas prices and the way airlines treat them, experience electrically powered 200-mph trains. But big oil and aviation can't attack high-speed rail directly - that would be an obvious attempt to abort competition. So they hire a "think tank". Where does the corporate cash and propaganda end and the legitimate criticism begin? It was impossible to know in Florida, where high-speed rail was killed using the same techniques. China plans to expand its high-speed rail network by 3,200km in 2019, which is more than is currently being operated in either Spain, Japan, Germany or France, in a bid to aid a slowing economy locked in the trade war with the United States. While travelers in places like Europe and Japan enjoy high-speed rail travel, Americans are forced into a continued dependence on fossil fuel. Amtrak trips are either exorbitantly priced or entirely illogical... Even when travelers catch a bit of luck and get a discount price and a direct route, there is no guarantee of service since Amtrak has to share tracks with freight cars. Since commerce is king in American capitalism, Amtrak departure and arrival times are more like a best guess than a schedule. The solution... is exceedingly simple. Make a serious national commitment to create high-speed rail service. Not a public-private joint venture or an outsourced pastiche of private lines, but a national public rail service. If given the choice between the green efficient trains and pollution belching buses, I am sure millions of Americans would hit the rails.